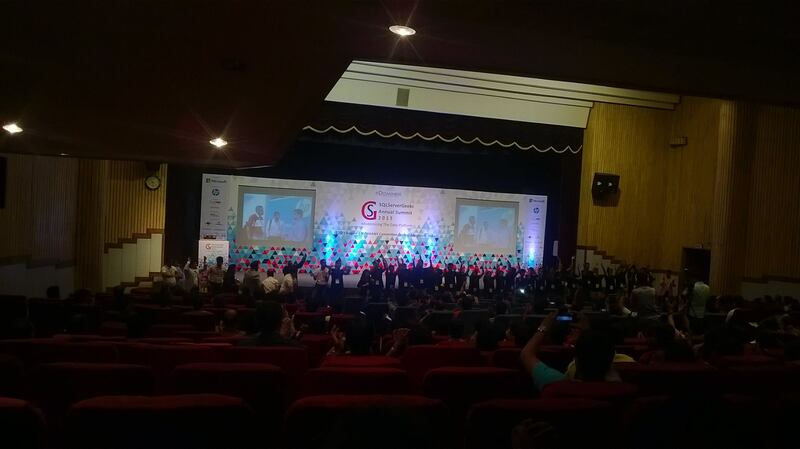 This year I got an opportunity to attend the SSGAS 2015 i.e. 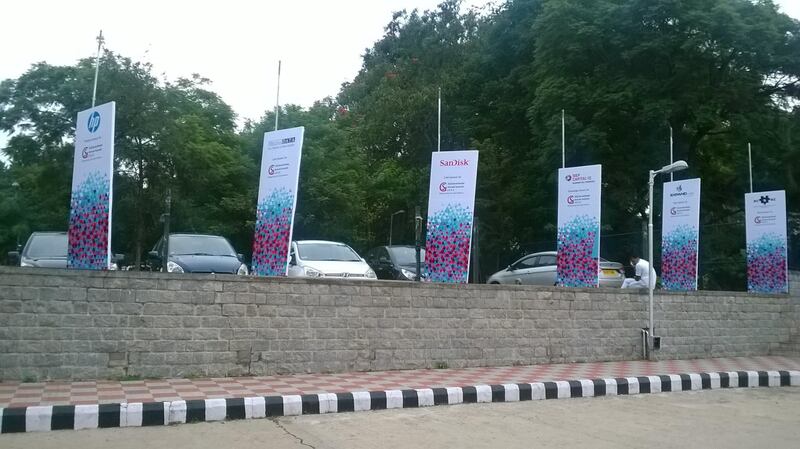 SQL Server Geeks – Annual Summit, the first time ever, large scale professional SQL Conference in India, Bangalore (KA), India, on Aug 27-29, 2015. 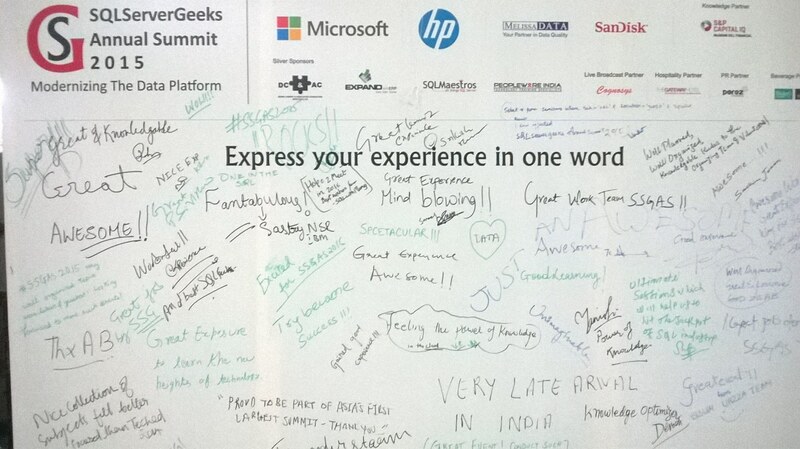 This was a 3 day conference organized by the SQLServerGeeks team, headed by Amit Bansal, covering sessions on Database Development, Administration, BI & Analytics, Big Data and Cloud & Azure Platform, delivered by expert speakers from Microsoft, MVP & MCM Community and Industry leaders. I would like to share the sessions/topics I attended, their details and links to external references with my readers. SQL Server 2016, new innovations Sanjay Mishra (MSFT) Introduced various new features in SQL 2016, link. Azure SQL Database, now & future Lara Rubbelke (MSFT) Detailed deep dive on Azure SQL database, link. Tabular vs Multidimensional in SSAS Alberto Ferrari Details and differences between the two, link. Business Prediction using Microsoft Azure ML Deepthi Anantharam (MSFT) Demoed a scenario on predicting income by reading different metrics, link. 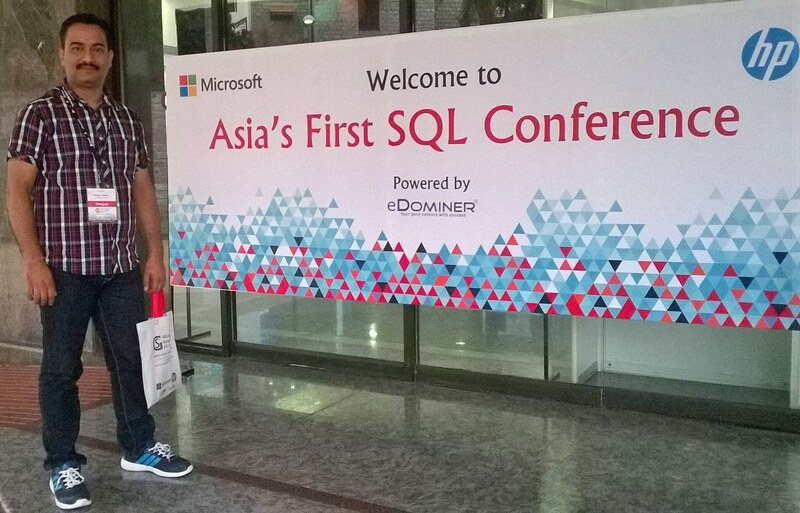 Column Store Index: SQL Server 2014 & beyond Sunil Agarwal (MSFT) Detailed deep dive on ColumnStore tech, link. Advanced SQL 2014 Reporting Tech Dr Subramani Paramasivam Detailed deep dive on Reporting Services (SSRS), and demoed how to configure Reports, connections and properties. In Memory OLTP: SQL Server 2014 and beyond Sunil Agarwal (MSFT) Detailed deep dive on In-Memory tech, link. SQL Server Performance Tuning Amit Bansal/ Manohar Punna (SSGAS) Demoed performance tuning by using Query Store tool, a new feature of SQL 2016, link. Analytics with Column Store Index Praveen Srivastava Discussed and demoed ColumnStore indexes, link. Troubleshooting SQL Server Tips & Tech Amit Khandelwal/ Sumit Sarabhai (MSFT) Customer centric perf issues, creating dump by using SSDIAG & PSDIAG tools, and their dump analysis by SQL Nexus. 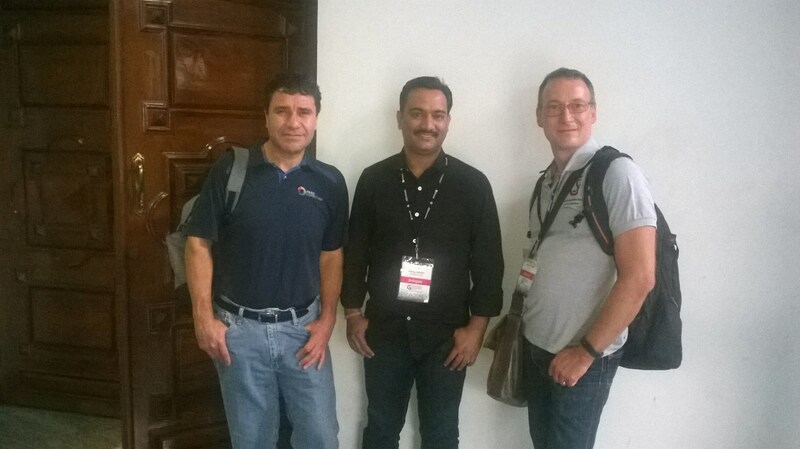 Query Processing in In-Memory OLTP Benjamen Nevarez (MVP) Discussed about In-Memory features in SQL 2014/2016, link. Big Data for the SQL Ninja Scott Klein (MSFT) Demo on spinning up a new Hadoop cluster and Blob Storage on Azure. Dive into the Query Optimizer Benjamen Nevarez (MVP) Discussed QO internal and Trace flags, link. SQL Server under attack via SQL injection Anderas Wolter (MCM) Preventing SQL Injection, link. Operational Analytics in SQL Server Sunil Agarwal (MSFT) Real time analytics with ColumnStore, link. Understanding Parameter Sniffing Benjamen Nevarez (MVP) Checking and resolving incorrect plans created by SQL DB engine, link. SQL Server 2016 Stretch Database Stuart Padley (MSFT) Stretch Database demo to stretch on-prem SQL table to Azure DB, link. Dealing with Bad Roommates – Resource Governor Joey D’Antoni (MVP) Discussed about how to manage SQL workload and system resource consumption, link. Evangelizing SQL Server Dev paradise Mahendraprasad Dubey/ Narendra Angane (MSFT) Customer centric perf issues due to Blocks, Waits and Latches, resolving them by refactoring their SQL Code. Social Media Sentiment Analysis using Hadoop on Windows Debcharan Skarkar (MSFT) Intro, demo. With Scott Klien, [twitter], the Microsoft Channel9 host. 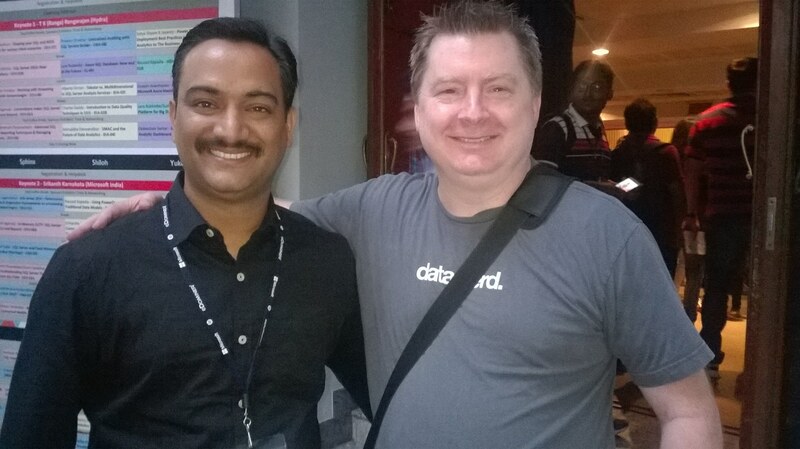 With Benjamin Nevarez, [twitter], [blog], the SQL Server Performance guru and author of Microsoft SQL Server 2014 Query Tuning & Optimization book. And Alberto Ferrari, [twitter], [blog], founder at SQLBI and author of Microsoft SQL Server 2012 Analysis Services: The BISM Tabular Model book.